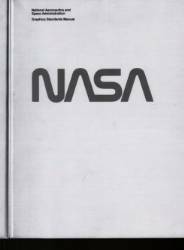 Binder containing NASA's visual identity guidelines. The original visual communications system, designed and augmented by Richard Danne and Bruce Blackburn from 1975 on, was rescinded in 1992. It was made available to the public by NASA as a PDF document before being reprinted in an expanded deluxe edition by Jesse Reed and Hamish Smyth in 2015. It is an exhaustive presentation of visual identity – from letterheads to the markings on the space shuttle Discovery—and thus allows the reader to apprehend the different formal, political and technical scales of the use of signs.